As a manufacturer of compatible thermal printheads, our customer service, engineering and design staff are often called upon by our customers to troubleshoot a variety of printer and printhead issues. 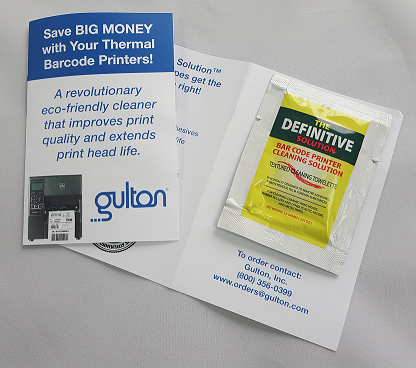 It’s because of that close connection with customer challenges that Gulton is aware of just how often proper cleaning and maintenance (or lack thereof) can be involved in thermal printing issues. So today, we’re introducing you to our Eco—Friendly Thermal Printhead Cleaning Wipes. These wipes are a great favor you can do for your investment in thermal printing. Use them regularly and you’ll see a difference in print quality and performance. They’re priced right too, at just $38 for a box of 25 wipes. Take care of your investment in quality thermal printing. Click here for the details.